The Mucky Nuts Face Fender, formerly known as the Bender Fender, is the first member of the Mucky Nutz fender family. The Face Fender came about when the designers became tired of bulky, awkward mudguard solutions and decided to take matters into their own hands. Used and endorsed by many pro DH and Enduro riders, at 22g, it is the lightest and most versatile mtb mudguard available. 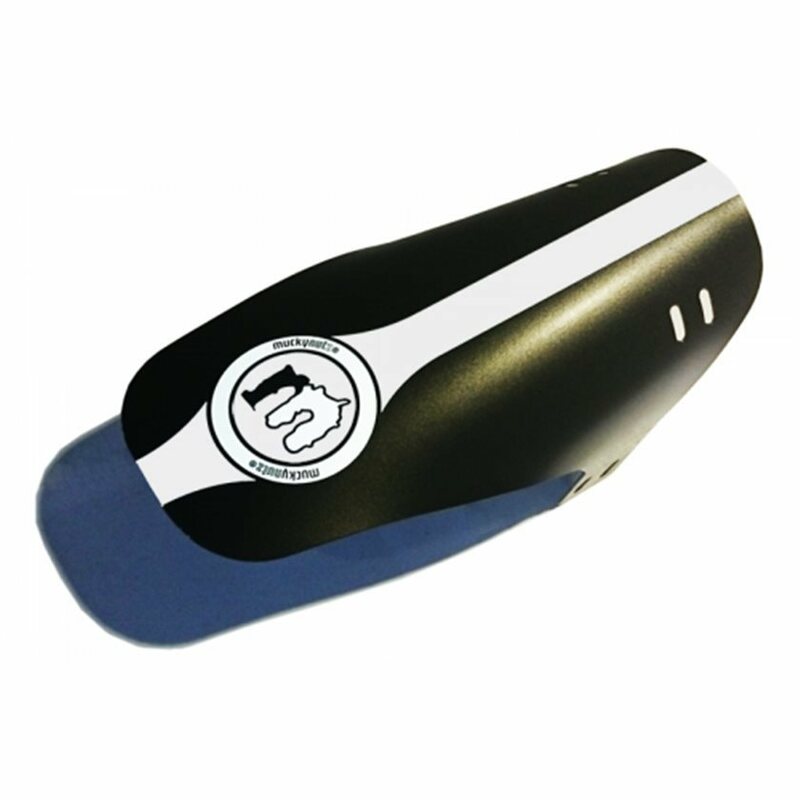 It can be used as a fork mounted mudguard; to protect the face and fork seals, or as a rear fender; to protect your rear shock and/or front mech. Made from durable plastic, when fitted using the supplied Velcro fasteners the mudguard takes the shape of your fork bridge, minimizing the loss in tire clearance. It then catches mud, spray and whatever else you might pick up. Since the mudguard is installed so close to the 'knobbly bits', it's small and discrete, which is a big plus for those that don't like using them, and as it is so thin it adds negligible weight to your bike. Protects your fork stanchions and bridge from getting caked, reducing the need for cleaning and servicing. Easy to install. Works well. The only thing is it doesn't have the rad racing stripe as shown in the picture, and I feel that negatively impacts the performance, particularly how fast I can go with it attached. Seriously, the graphics on mine are way more subtle. It just says Mucky Nutz on the side, and I'm perfectly satisfied with that. Mucky Nutz is easy to install and effective at defecting most of the sand and mud from those expensive to replace forks, pivot points and rear shocks. I've got them on the front and back of my black Yeti and they're are barely noticable and since I have them attached with the provided velcro if ever dries out they can be easily removed. Fast on time delivery as usual. 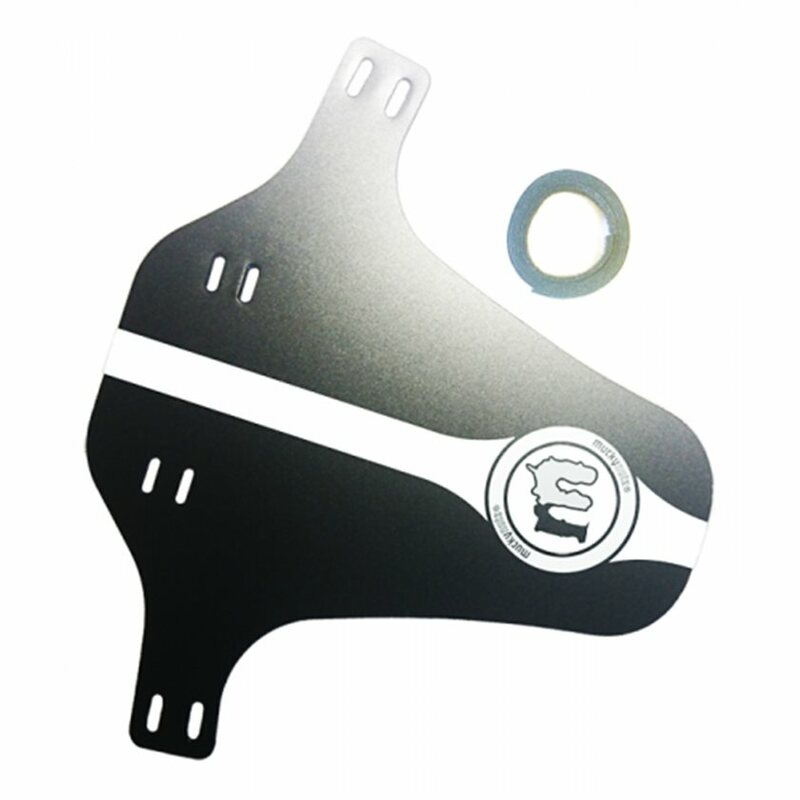 Great fender for front or rear! Lee's most of the mid off my linkage and fork stanchions, saving me from more maintenance! Highly recommended!! Was surprised how much they do when I went for a ride in the wet without them on my bike. Huge return on very cheap investment. Only downside is they're not super durable. Eventually the plastic zip tie tabs wear out. Super easy to install and stays snugly in place. I haven't noticed mud hitting me in the face since using this fender. I am not sure this is a pro but it makes the bike a little cooler. It's super easy to install with the included Velcro roll. Keeps your fork clean and mud off your face. Looks great! A must have addition for any mountain bike! No issues or concerns with service or delivery. Great guard, easy to install. I installed w black side up for stealthy look. It will build up w mud in really sloppy condition, but I probably shouldn't have been riding in those conditions anyway. Works great on S-works enduro 29er. Went on easy. Came with velcro for easy mounting. The fender looks good and feels sturdy. It has 4 slots so that you can secure it well and shape it to your fork's arch. Since installing it, I no longer have a problem with water or mud splashing up into my face while riding. Solid simple cheap design. Should fit most fork configurations. Keeps the mud from flicking up in your face. Works great, does what a front fender is supposed to do, holds up well and looks good! This little fender works great! Very good delivery service, usually same day shipping of order. Works just as intended. Simple graphic without being too much. Don't ride in the winter without one. The face fender is light weight and easy to install and helps shed rocks and mud or water away from the cockpit. Got all my parts I ordered a day ahead. Was very happy with the service - and delivery of my parts. overall effective, nothing fancy, fitment is ok on my Fox, a long strip of 'hooknloop' that you cut to size, so far its minimized some of the dirt facial. I don't regret it, it can be made easily from plastic, but the slots and strapping make it easy to install so its not a bad deal. Jenson is great every time. Great fender. Does it's job really well. I really like the velcro instead of the cable ties. Makes taking it on and off much better. Only 1 con, I wish the velcro was precut to fit better on the fork. Good product and priced Right. Overall a good purchase. Fits my Manitou boost fork pretty well. I would have liked to make my own punchouts to tether to the fork. Otherwise works as advertised . I bought this fender for my 160 MM travel Fox 36 fork in hopes that I could keep some of dirt from building up around the seals. After ten minutes, I ended up taking it off and tossing it into the garbage. Overall, the fender is just janky. I really wish someone would come up with something better than a fender made from a cheap piece of plastic and some Velcro to put on a $4500 dollar mountain bike. Just sayin'. Will this fit a rigid boost fork? BEST ANSWER: It comes flat. I'm sure you could adjust it to fit any fork. I folded mine by hand before i put it on my bike. It should fit any fork ive got one on my 79 trek road bike and my santa cruze nomad. yes but might have to modify to make it fit.